This solution starts by applying a simple substitution key to produce the plain text. But like many other solution attempts, this one relaxes the constraints of the cipher text, again permitting construction of words and phrases by re-arranging the plaintext. Worse, this solution allows letters to be added and removed arbitrarily from the plain text, greatly easing the construction of interesting words and phrases. We already know that the use of anagramming allows a codebreaker to choose from a huge variety of words. Examples of this include solutions by Daryll Lathers, Özcan Türkmen, Robert Graysmith, and Hal Kravcik. Even a small chunk of plain text can produce many possible words. For instance, let’s look at the four letter sequence SLIA. If you rearrange those four letters, you can produce these words: LISA, SAIL, LAIS, ILSA, AILS, SALI, ASIL, ISLA, LIAS, and IALS. Similary, the four letter sequence TSPA can be rearranged to make these words: PAST, TAPS, SPAT, PATS, APTS, SAPT, and PTAS. How do you know if you’ve selected the correct word? Does it just “feel” right, because you think Zodiac must have used certain words instead of others? No, verification of the solution demands stronger evidence than that. Sonja C increases the pool of words by allowing the addition or removal of letters, making certain words appear more readily. Here’s an example of how much freedom you have by using this method: If you allow only one more letter to be added to the sequence SREA, then it can be arranged to form these words: YEARS, AREAS, RATES, SHARE, RAISE, TEARS, FEARS, SPARE, ARISE, ACRES, AROSE, RACES, READS, LASER, SAFER, BEARS, WEARS, CARES, STARE, HEARS, PEARS, SWEAR, FARES, WARES, GEARS, SPEAR, SMEAR, SCARE, EARNS, AIRES, SHEAR, EARLS, MARES, HARES, ERASE, ARIES, SAVER, SABRE, DARES, SEARS, RAPES, SNARE, DEARS, PARSE, REAMS, RAVES, NEARS, RAGES, CESAR, RAKES, ARSES, SAYER, REAPS, SARGE, REARS, SABER, BARES, AKERS, SERRA, ARLES, ARENS, AYRES, ASHER, BASER, MASER, AYERS, SANER, ROSEA, RASEN, SACRE, ARSED, ANSER, AGERS, SAYRE, RNASE, REALS, ASTER, TARES, MEARS, VERSA, MERSA, AVERS, ACERS, SARRE, CARSE, SERVA, SERIA, SEMRA, SAUER, HASER, RASES, ESARN, APRES, and RBASE. Every one of those words consists of the letters A, E, R, S, and only one additional “wildcard” letter. 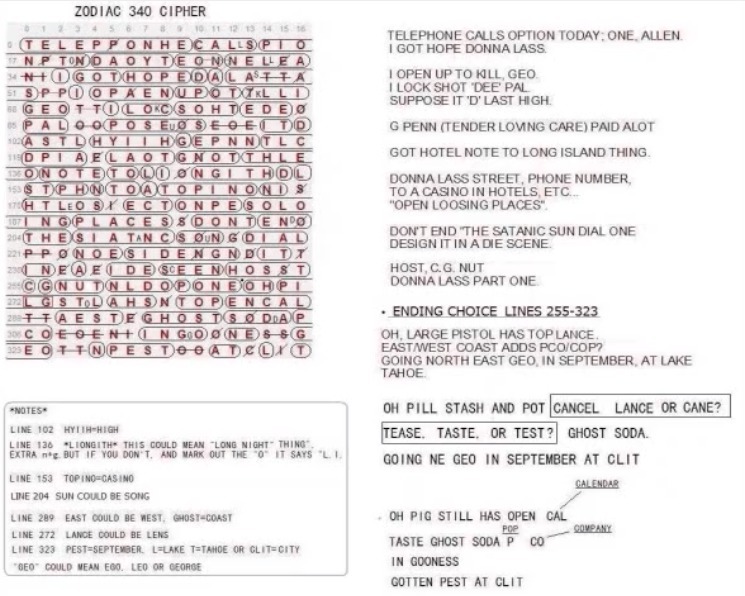 For example, the first column of the plain text reads TNNSGPADOSHITPICLTCE, which Sonja C rearranges into D TOSCHI SAT CLIP G PENN, leaving out only one letter: T. Seems interesting, since the sentence mentions Zodiac-related personalities Dave Toschi and Gareth Penn. But the same text can be rearranged in numerous ways. 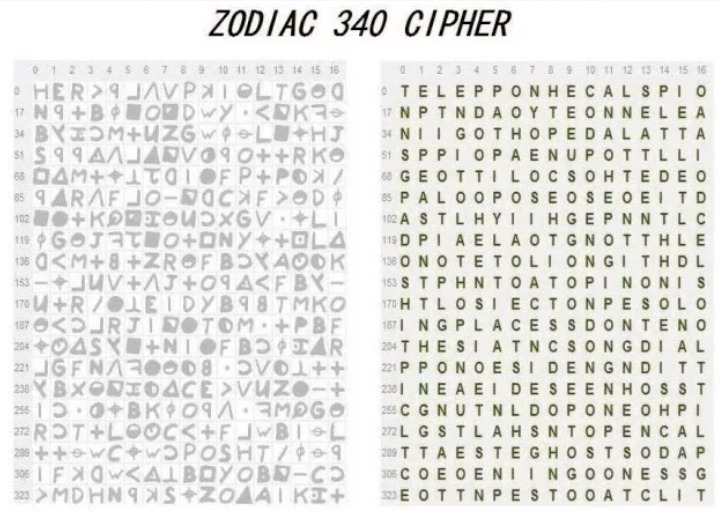 These other “Zodiac-oriented” words can also be found among the same letters: PLOTTING, INCIDENT, HOSPITAL, TIPLINE, TIGHTEN, STATION, STOLEN, POLICE, PISTOL, STINE, PINES, NIGHT, LODGE, LINDA, LEIGH, HOTEL, HOLES, HANDS, DONNA, DITCH, DEATH, CODES, CHEST, CASES, TIED, SHOT, LONE, LIST, LASS, HIDE, DIES, and COED. Which words are the correct ones? PHILPOTT, ANTIPHON, TOWNSHIP, SHOPLIFT, WINTHROP, STROPHIC, HYPNOTIC, PINOCHET, ATROPHIC, PROHIBIT, HOTPOINT, MEPHISTO, POTIPHAR, OLIPHANT, HIGHSPOT, HILLTOPS, PHAISTOS, PONTHIEU, HOPLITES, TROPHIES, TRIOMPHE, ETHIOPIA, PHOTOFIT, PHONETIC, SHIPSTON, and HELIPORT. HI. I TIME THE BEER POET. I’M PETER. I BITE THE HOE. HI! TIME TO HIT BEER PEE! HI! TIME TO HIRE PET BEE! I BETTER HOPE I TEE HIM. BE HERE. TIPTOE. TIE HIM. None of this, unfortunately, can be shown to be anything more than diversions of word play. I’ve indulged in the same word play in this article, partly for fun, but mostly to demonstrate how easily we become ensnared by the cryptograms. That solution doesn’t work when the cipher is treated as substitution. Can you explain how you got the solution? California a kingdom of… suspect name. Count the empty spaces, its match only one. ok? L.m.h.m. You have to make a chart. zodiak code got arabic numbers, 1 to 26, masonic signs, some of them modify by zodiak, the own zodiak signs, caesars code in 0,3,6,9,12 and the main clue that is hard to find. Yuo have to put all that in order and something else. and then, you will find the meaning of each sign, letter etc exemp the first sign after her is masonic and came to be e. or 9 come to be i .
Zodiak had to have a chart to pick letter and changed to a sign, or viceversa. 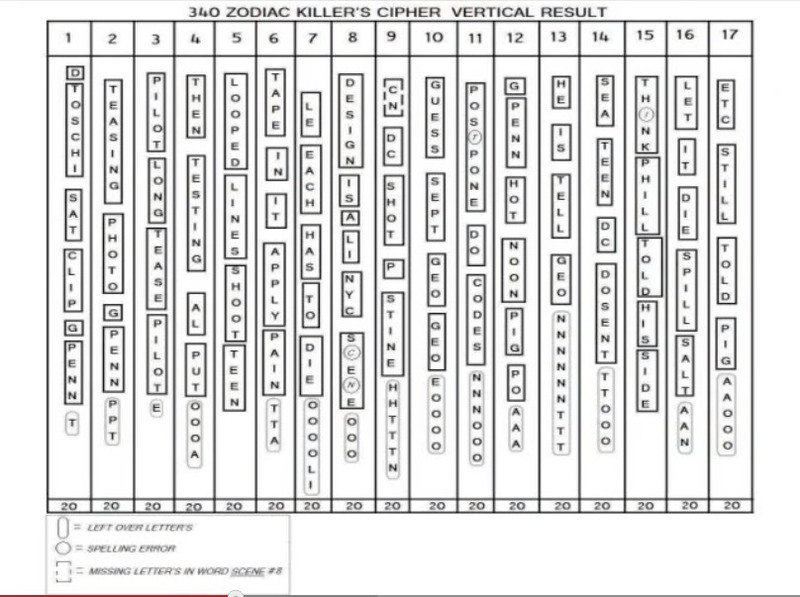 with that chart is easy to encode and real hard to decode. I think you will need to show your work before your solution can be verified. Can you post the chart, exact steps, etc? You want to make your own chart? a can explain step by step. i want to know if all 340 that i got, and the way i did is ok. i will tellyuo that something else. and yes, got the name on it. the same as z32 code. Yes – at least show your steps, so others can reproduce your solution. From there we can figure out if the method is OK. They probably won’t respond, unless you have come up with a solution that does not permit arbitrary messages to be inserted. Most solutions I’ve seen allow arbitrary messages to be inserted, and I suspect your method has the same problems. You can go over your steps here if you want help determining if your method has problems. On the card, from your secret pal, paradice means lawrence. can be read, lawrence slaves, by fire, by knife, by gun, by rope. is on caesar code on 3 steps, he use the arabic number too. 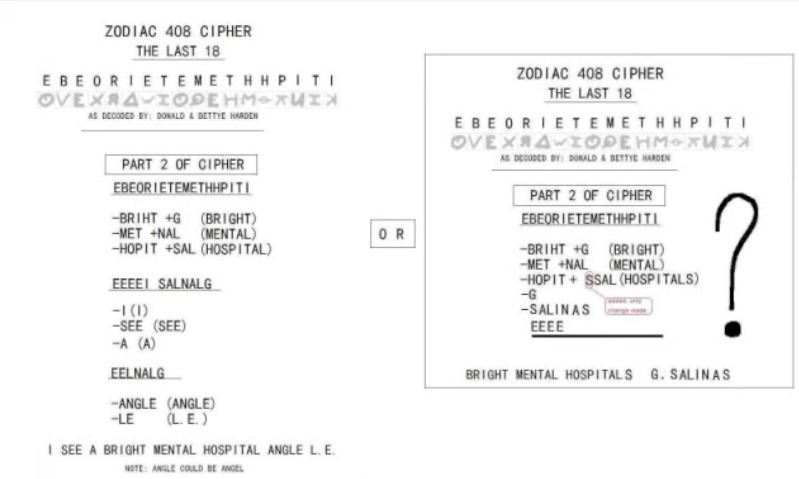 Like i said before, time ago, yuo need a chart, with all codes that zodiac used. caesar code in 3,6,9,12 steps bakcward. Make sense? if you going to work on something, you need a bench poit, right? that was zodiacs bench point. a encoding chart. I know, is hard to believe, but in z340 is the complete name, read like this, start with a period, ok? .lawrencekaneknownaszodiac.navysman. start on row 14 and ends on row 16. Z match the same place, like 21 more letters. Need more? z13 read, wantedeternal. atrick of zodiac. turn 180 degrees tha code and you will foundout. Not enough? ok, z32 read, california a kingdom of lawrence cane.